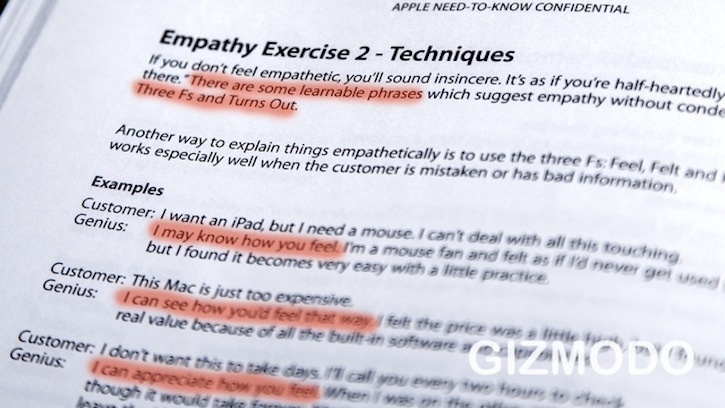 Tech blog Gizmodo has reportedly received a copy of the Apple Store’s closely guarded training manual, which introduces new employees (“Geniuses” in Apple parlance) to Apple’s empathetic customer service routines and policies. 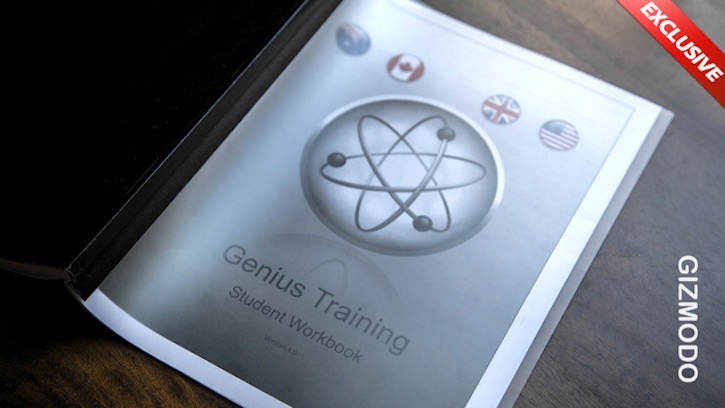 Apple has not confirmed that Gizmodo has a legitimate copy of the manual, however. The guide contains a list of “positive” and “negative” behaviors, included to get Apple staff members to pay attention to customers’ body language in order to increase the chances of a sale or a positive conflict resolution. During training, Apple Store employees reportedly learn that an unbuttoned coat represents a cooperative attitude, a tilted head shows that the employee is “evaluating” a customer’s concerns or questions, and that moving in closer indicates “acceptance.” Every aspect of customer interaction is carefully controlled to increase the chances of a sale. There are also sections that explain the importance of positive interactions with customers, since happy Apple Store visitors are more likely to make a purchase. 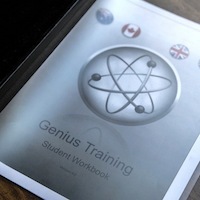 Empathy and Compassion Exercises – All Apple Geniuses attend a two-week empathy boot camp as part of their training. To learn how to influence customers by being empathetic, employees run through exercises where they sell to one another with the “Three F’s” concept: feel, felt and found. A.P.P.L.E. 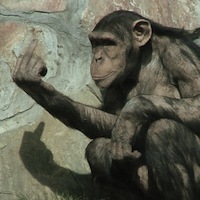 – When approaching customers, Geniuses are expected to follow A.P.P.L.E.–Approach, Probe, Present, Listen and End. Employees run through A.P.P.L.E. Several times during their training to learn to relate to customers, whether they’re dealing with customer hardware issues or actively trying to sell a product. The manual tells employees to take their time during these interactive states and to craft each approach to individual customers, changing aspects of A.P.P.L.E. as necessary to control and improve the experience for each Apple Store visitor. Fearless Feedback – Apple’s apparent preference for positivity extends to its staff interactions. Rather than complaining about their coworkers’ approach, Geniuses are expected to present “fearless feedback,” which is more empathetic and more positivity-oriented than negative feedback. Guided Interactions – The manual also instructs employees to “guide every interaction” by taking a strong approach with customers, taking initiative to address questions before they’re asked and to “inspire” customers to make purchases. In other words, Apple wants its employees to use passive sales techniques. In order to instill this in employees, Apple’s essentially using psychological training techniques that emphasize listening to—and watching—customers to address their individual needs. Apple also expects its employees to use special language when correcting customers in order to avoid offending them. Instead of correcting a customer outright, a Genius must say something like, “it turns out…” before giving the customer the correct information. This approach is meant to take the employee out of the middle of the situation and allow for a more passive interaction with the customer. While many entries in the manual wouldn’t be out of place in an anthropology or communication studies textbook, Apple clearly states that “everyone in the Apple Store is in the business of selling.” If the manual is legitimate, it’s a fascinating look at how Apple has developed a positive reputation with its customer base by teaching its employees to look, listen and use subtle, passive techniques to make sales.